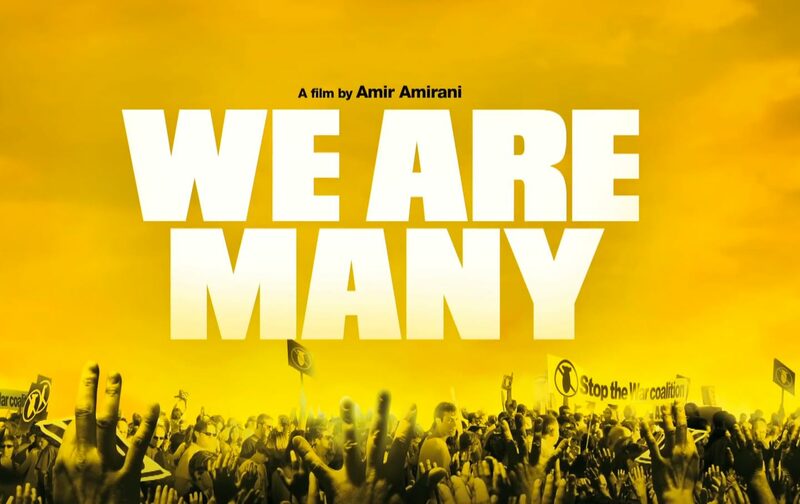 It’s that last line that Iranian-born filmmaker Amir Amirani borrows for his moving documentary about the worldwide demonstrations against the Iraq war on February 15, 2003. We Are Many tells the inside story of the day that millions of people took to the streets to say no to war, in over 800 cities, 72 countries, and even in Antarctica. Robbie Lieben, a former science support technician at the McMurdo Research Station recalls how that last one happened. “I had a subscription to The Nation.” In a column, he read that there were to be demonstrations worldwide, including in Antarctica. “We can’t let down the great Alexander Cockburn, so we’re going to have to do something,” he says. Days later, he and 70 of his colleagues bundled themselves up in bright red parkas and sprawled on the ice in the shape of a peace sign. It got Lieben fired. “Even if I’d known, I think I’d have done just the same thing,” he concludes. Amirani does what mainstream media typically don’t: He puts the event in the context of a large historical sweep. “Mainstream media don’t want to know the history of anything,” said the film maker at a screening last year. He traces the origins of February 15 back to the Stop the War Protests in London immediately after 9/11, and the gathering in Florence after the World Social Forum in 2002 where the decision to call a globally coordinated day of protest was apparently taken. Leading lights of the left, from the late Tony Benn to Harry Belafonte, appear next to first-time protesters (Amirani was one of those). “The people will be heard. There will not be a war against Iraq,” rally organizer Leslie Cagan is seen, telling the massive, frozen crowd outside the United Nations. “Maybe for the first time in history we could actually stop the bad guys from doing something horrendous” Cagan remembers thinking. More questionably, the film then sweeps forward, from the invasion of Iraq, to the Arab Spring, and the British House of Commons vote against intervention in Syria in 2013. Dashed hopes notwithstanding, “an open mind is hard to close” Amirani told The Laura Flanders Show. Phyllis Bennis, fellow at the Institute for Policy Studies, captures the film’s message, noting that “movements can achieve victory even when they look like defeat.” What grew after 2003, says Bennis, was movement confidence. In Egypt, specifically, the film speaks to activists, who, having mobilized only a tiny anti-war protest on February 15, went on to organize a bigger one, just a month later. “That’s exactly what I was thinking, and others, that if we tripled that number or four times that number, we could take down Mubarak, Hossam el-Hamalawy says. We’ve certainly seen more globally coordinated demonstrations since 2003, including consecutive “risings” against violence toward women and last year’s climate marches. Unfortunately, the war machine grew too. It’s hard to feel very perky about the state of the world’s peace movements when there’s so much blood being shed and more war on the horizon. After the so-called Peterloo massacre in Manchester, a movement emerged set on expanding the franchise and repealing anti-labor laws.The Combination of Workmen Act was passed within a decade. Two thousand and three’s massive global mobilization can claim no significant effect on the state, which went to war regardless of public opinion. “Was there a subsequent discussion about reorganizing the state, a new charter, a new international movement? On the contrary, we’ve seen the intensification of war,” says movement historian Peter Linebaugh. Think of interconnected global communications these days, and you think of killer drones and NSA surveillance. Nonetheless, musician Damon Albarn is wrong to suggest that after February 15 people stopped demonstrating. They didn’t, and haven’t. The anti-war and anti-austerity movements have certainly grown closer. They’ll be demonstrating with climate-justice activists outside the COP21 meeting in Paris—if French troops don’t stop them. We Are Many is in the running for Academy Award nomination. It’s playing in theaters around the country this December.